At the Arlington, Virginia, headquarters of the Freedom Forum some years back, a visitor couldn't help inquiring about a large abstract painting showing a man and a woman on a horse following a bird in flight. The painting, the visitor was told, was titled "Free Spirit." The visitor expressed surprise, as he recalls it, because the figures in the painting appeared to be on a downward trajectory. A staff member then related an often-told Freedom Forum tale. Upon selling the painting, it seems, the painter had agreed to Freedom Forum's request to re-name the work. The original title: "The Abyss." Recently, the once high-flying nonprofit found itself, like the bird, plunging headlong into an abyss. From a high of almost $1.1 billion two years ago, the foundation's endowment declined to a low near $700 million by the end of August 2001, losing more than a third of its value (it had risen to $760 million with the stock market by November). Chairman and C.E.O. Charles Overby was quick to acknowledge that cuts to the staff of 285 were inevitable, but nevertheless portrayed the crisis as an opportunity to continue on the "way to greatness." While this might adversely impact other Freedom Forum priorities, which include newsroom diversity, First Amendment issues, and international programs, Overby stressed that it would allow the Forum to concentrate on its jewel, the "Newseum." Freedom Forum would double attendance by shutting its old facility and building a new showpiece of journalism on America's museum row in Washington. Not everyone shared Overby's excitement, especially after he announced that the worst cuts would fall on the most fragile of the Forum's programs: the much-praised efforts to lend succor to foreign journalists struggling in some of the world's toughest arenas. The overseas operation -- with offices in Johannesburg, London, Hong Kong, and Buenos Aires -- would be shut down in its entirety. Clearly, something had to give, and the Newseum wasn't going to be it. The foundation had already plunked down $100 million for the last commercially undeveloped real estate between the White House and the Capitol, and was itching to expand from its limited current Newseum space across the Potomac in Rosslyn, a section of Arlington that is off the prime tourist track. The decision to further downshift from its role as perhaps the world's leading supporter of journalistic discourse and professional improvement to that of a museum operator stunned many. The narrowing of mission, coupled with remarkable financial losses, brought out long-harbored doubts concerning the foundation's management. "What makes it all the sadder, really," says one veteran of journalism philanthropy, "is that they are so consumed by their excesses that it tends to minimize what have been some real accomplishments." If such well-regarded initiatives as the First Amendment Center and the diversity program were nutritional snacks for American journalists, then for some struggling foreign reporters the international division was a hearty meal. In recent years, the foundation's European Centre in London became a hub for journalists trying to get the truth out about what was going on in Bosnia, Kosovo, and other parts of the former Yugoslavia; it also sponsored a study on the extent of post-traumatic stress disorder in frontline journalists and provided safety training. Freedom Forum-sponsored events ranged from hosting an unprecedented joint appearance by six presidential candidates in Ghana (thereby promoting not just free speech but democracy), to assembling journalists from nine Asian nations to brainstorm on the challenges of political reporting in countries with fragile press protections. The Forum's president, Peter Prichard, in an interview at the foundation's offices in Arlington, conceded that "the international programs were great. You're going to countries where journalism's just developing, and people are sitting around talking about how they can avoid being killed, whether they can get enough newsprint, whether they can stay out of jail if they've written an offending article or drawn an offensive cartoon . . . ."
In an October e-mail to friends, Arnold Zeitlin, former head of Freedom Forum's Hong Kong office, describes the decision to spend millions on the Newseum as a "choice between bricks, glass and mortar -- and people." He also quotes his son, a senior Goldman Sachs managing director, who criticizes the financial decisions at the Forum. "In a more accountable institution," Zeitlin concluded, "the senior management would have to resign." For John Owen, former director of the Forum's European Centre in London, it was a question of seriously misplaced priorities. "The people who run the Freedom Forum, I am ashamed to say, betrayed the commitments they made all over the world to support the cause of free and independent journalism," Owen told the British Press Gazette Online. "The irony is that in order to construct a new, expensive, state-of-the-art facility in Washington, we have shut down other buildings and evicted the very people that someday this Newseum will be honouring for their journalism." As inside critics began questioning management's finances and priorities, the foundation began offering contract buyouts. About 120 employees took them, leaving a staff of 167. Those agreeing to leave were required to sign confidentiality agreements that bar them from criticizing the organization. Departing staff members were not even allowed to keep a copy. In truth, the Freedom Forum has been a walking target since Allen Neuharth retired as chairman of the giant Gannett Company in 1989, took over the helm of its nonprofit offshoot (then known as the Gannett Foundation), and moved it from Rochester, New York, to an office complex in Virginia which included headquarters for the newspaper chain as well as its flagship, USA Today. Right from the start, Neuharth thought big. In a few years he transformed a modest organization, which had mostly sponsored good works in communities where the Gannett Company owned newspapers, into a global promoter of journalistic values. Among its many admired initiatives: adult literacy programs, production of handbooks on "best practices" for journalists, plus conferences and seminars on a broad range of topics for groups such as high school students and female reporters. In 1991, Neuharth sold back the Gannett Company stock whose dividends had undergirded the foundation since its launching in 1935 by Frank Gannett. The sale netted $650 million for the charity, which agreed to give up the Gannett name (thus "Freedom Forum"). While Neuharth began increasing the endowment toward its late-1990s high of $1.1 billion, he also continued to indulge a taste for the high life that might have been appropriate for the head of a profit- making newspaper company but which raised eyebrows in the nonprofit world. "He always said you might as well go first class, it's only little bit more expensive, and is a hell of a lot more fun," recalls John Simpson, the executive editor of the Los Angeles Times Syndicate International, who spent twenty-eight years at Gannett, the final ones as deputy editor of USA Today. In fact, first class was probably a great deal more expensive, both to the organization's coffers and to its reputation. By 1991, critical articles were appearing about lush living at Freedom Forum, and that year the attorney general in New York state, where the group was then registered, started an investigation. By the time it was over, in 1994, the foundation had been compelled to promise to halt the excessive or imprudent expenditures that might violate its nonprofit status. The list of offenses, both officially catalogued and otherwise, included lavish trips for the brass on first-class air tickets and stays at the world's finest hotels, not to mention the foundation's purchase, as part of its $15 million office renovation, of a $1 million art collection through a Florida gallery owned by a friend of Neuharth's. In addition, Neuharth was made to reimburse the Forum $30,000 for the 2,000 copies of his autobiography, Confessions of an S.O.B., it had bought in small quantities in bookstores around the country to ensure a spot on the New York Times list of best-sellers. Over the years, Neuharth's management role has diminished; today, at age seventy-seven, he is a paid consultant to the foundation, with the title of "senior advisory chairman." But the men he brought in as his successors still accord him costly comforts and honors. After he had retired as Freedom Forum's chairman, the foundation built Neuharth his own office on the roof of its headquarters -- even though Neuharth spends the bulk of his time in Cocoa Beach, Florida, where the organization's Florida office, one of the few outposts not scheduled for shuttering, is across the street from his oversized log cabin-motif house. Freedom Forum has also committed millions of dollars to honoring Neuharth. It hired Michael Gartner, a former NBC News president and Freedom Forum fellow, as well as a Freedom Forum First Amendment Center trustee, to write an authorized Neuharth biography, only to cancel the project last year when Gartner assembled some unpalatable material, including the story of a woman who claimed she was Neuharth's long-ago and ignored out-of-wedlock daughter. The New York Times criticized the decision to kill the book in an editorial titled "Free Press, Everywhere but Here." Other Neuharth testimonials include the Al Neuharth Media Center at his alma mater, the University of South Dakota (Freedom Forum gave about half the $4.5 million cost of the renovations) and the Allen H. Neuharth Award for Excellence in Journalism (given in 2001 to Jim Lehrer of The NewsHour, an honorable journalist who had just been heavily criticized for his slow-pitch softballs to the presidential candidates in the debates). The Allen H. Neuharth Free Spirit Awards (established by the Forum with a $25 million endowment), hands out $1 million annually to one or more individuals or organizations "that make major contributions in areas of free press or free speech," some of whom are "spirited" though not necessarily in journalism, including the first blind person to reach the summit of Mount Everest; Chuck Yeager, the test pilot who helped break the sound barrier; and the young Elián González. Now, Neuharth's successor, Overby, the former editor of the Jackson, Mississippi, Clarion-Ledger, has gotten into the act. The day after warning the staff to expect deep cuts, he flew to his alma mater, the University of Mississippi, for the naming of the Overby Media Center -- funded with $5 million from the Freedom Forum. Self-serving generosity has been a hallmark of the Forum under Neuharth and his handpicked successors. More than eight years ago, the Chronicle of Philanthropy reported that Neuharth's then-compensation of $131,000 was more than ten times what other non-C.E.O. chairpersons of similar-sized foundations received, and the overall remuneration rates to brass were three to twenty times those of similar operations. In 1998, the last year for which salary information is available, Neuharth, having retired as foundation chairman, nevertheless received $316,000 in salary and benefits, and $187,000 in expense and other allowances. Chairman and C.E.O. Overby's salary and benefits, excluding expense allowance, were $502,000. Although he declined to provide a current figure, he is said now to earn closer to $600,000, a remarkable figure for an executive of a nonprofit who does not live near its headquarters but hundreds of miles away, in horse country outside Nashville -- which happens to be the site of the First Amendment Center at Vanderbilt University, the Forum's other satellite office that will remain open. Critics of these excesses have been equally troubled by the enormous losses in the endowment's investment portfolio. Many nonprofit foundations suffered during the past two years as part of the general economic downturn, a few incurring far greater hits, but Freedom Forum's losses are definitely on the higher end of the damage curve, according to John Griswold, senior vice president of the Common Fund Institute, a Connecticut-based organization that studies investing by educational endowments and other nonprofits. Freedom Forum's officials had put more than 90 percent of its investments into Standard & Poor's Index Funds, Prichard explained in a letter to CJR, a strategy which he has argued allowed the endowment to balloon so much in the first place (and inspired executives to dream of a grander Newseum). But Griswold says that the foundation was ill-served by putting itself so heavily into these funds, which have in recent years strongly reflected the boom-and-bust fortunes of technology companies, and in concentrating so heavily on stocks in general. "For a billion-dollar fund, putting it all in equities was a real roll of the dice, particularly when there were so many warnings in the press," says Griswold. "Thoughtful people acting as prudent men would have long since diversified. And most people did. So these people do stand out like a sore thumb." By comparison, the Miami-based Knight Foundation, another offshoot of a journalism dynasty, doubled in size during the last decade, even without crediting a $200 million infusion from the estate of James L. Knight. Slightly smaller than Freedom a decade ago, Knight is now more than two and a half times larger. There are fundamental differences between the two -- while Knight has remained a grant-making entity, Freedom Forum converted itself to an operating one (with greater administrative costs) some years back; still, even when these factors are taken into account, and even when Freedom Forum's operating expenses are discounted, the organization still lost more than 20 percent of its investment value while most others were down only in the low single digits. "We were taking some advice from experts, advice that was doing very well for some years, but that suddenly turned sour," says a Forum trustee, Paul Simon, the former U.S. senator, who is now director of the Public Policy Institute of Southern Illinois University. "We have had professional advice, but it turned out not to be any better than asking a guy walking down the street." According to president Prichard, the Forum's investments are managed by "seven or eight" major brokerage houses, but the ambitious growth strategy, largely intended to fund the new Newseum, was directed by the foundation's finance committee, chaired by Malcolm Kirschenbaum, a lawyer and real-estate developer in Cocoa Beach, Florida, which is Neuharth's hometown. Kirschenbaum represented Florida Today in the 1970s, when Overby edited it, and he has known Neuharth since the 1960s. As a result of investment reversals and heavy spending (including millions of dollars Freedom Forum poured into a joint twenty-four-hour public affairs cable venture with D.C.'s public television station WETA, only to pull the plug when it became apparent that cable operators would not carry it), the foundation has been retrenching on nearly everything but the Newseum for more than a year. In early 2000, the Forum closed its San Francisco-based West Coast office, anchor of a diversity-oriented internship program, which has been transferred to Nashville. Around the same time it closed its Media Studies Center, which had once been the nation's leading independent media think-tank, operating first from Columbia University and later from the top floor of I.M. Pei's showcase, the former IBM building in midtown Manhattan. Among other things, the center relied on its location at the hub of the media world to draw powerful and controversial practitioners alike to the table for discussion, and supported one-year fellowships that resulted in more than 100 books. Freedom Forum started phasing the program out several years ago. The New York office, which continued to be a satellite of the First Amendment Center, was shut altogether in November. Recently, the foundation's decision to buy pricey real estate on the mall in Washington, and the fancy plans it has for the spot, have drawn attention. When completed in 2005, the new Newseum will have, besides the main attraction and the foundation's offices, income-generating tenants, including shops, a restaurant and 100 housing units. The museum deal, completed in late 2000, essentially sealed the fate of the foreign programs and guaranteed cuts throughout the organization. With the foundation committed to spending the $100 million, and with its investments plummeting, there was no way out. The price includes $75 million for the land itself and another $25 million to a favored priority of Mayor Anthony Williams, a fund for low- and middle-income housing. This was a very large sum for any organization and, in the opinion of some Washingtonians, considerably more than even such a prime location was worth -- double its value by some estimates. Overby was so eager to grab the spot, where a D.C. office building was located, that he convinced the district to forgo the usually time-consuming process of putting land out for bid, and made an unsolicited offer. The amount, which constitutes the largest real estate deal ever involving city property, caused Freedom Forum staff members to gasp when they first heard it, according to an account in The Washington Times. Add to that several hundred million in construction and outfitting costs, and the total could top half a billion dollars even before the museum opens. "We said originally we thought the whole project would cost $250 million," said Prichard. "I think it will probably cost somewhat more than that, but we don't know yet. We're actually in the process of trying to figure all that out now." ''EVERYONE LOOKS WAY TOO GLEEFUL"
Regardless of the final bill, Freedom Forum leadership is convinced they have made the right choice in dumping the international division in favor of the Newseum. "We made a judgment that we can do more programs in the Newseum that are more effective and reach more people than we can do in any other way," says Prichard. This extended the philosophical shift that began when the first Newseum opened in 1997. The Freedom Forum, as Overby put it in the annual report that year, would aim primarily not at small groups of journalists but at the public. "Essentially, we went from wholesaling to retailing," he wrote, "from preaching to the choir to preaching to the entire congregation." One can get an inkling of what they intend to achieve by visiting the existing space. The Newseum, even in cramped quarters, is a triumph of sizzle. It creatively captures the events, figures, and artifacts of journalism in its finest and darkest hours. It features a staggering array of mementos, from a copy of Emile Zola's J'Accuse in the notorious Dreyfus case to Bob Woodward's notes from Watergate, plus constant screenings of short films on the Pulitzer Prizes, on how Hollywood portrays the press, on the Power of the Image (narrated by Walter Cronkite), and on the First Amendment. Video games offer visitors the chance to try their hand at selecting an editorial lineup and making ethical choices; schoolchildren can go on a mock set and make a video of themselves anchoring a newscast or play a game show, "News Mania." One wall features a 126-foot-long panel of video monitors that receive constant news feeds, believed to be the world's largest such display. Outside, in Freedom Park, is a memorial to reporters and photographers killed in action, remnants of the Berlin Wall and a real East German watchtower, original cobblestones from the Warsaw Ghetto, a toppled, headless Lenin statue, plus a casting of the door of the cell in which Martin Luther King, Jr. was held in Birmingham. Even Ben Bradlee, the crusty former Washington Post editor who is not known to have many kind things to say about Neuharth or Gannett's USA Today, is a fan of the Newseum, which he has visited with his grandchildren. Yet the insistence of the foundation's leadership that the Newseum represents the logical culmination of the Forum's mission, as catchily formulated by Neuharth, to promote "Free Press, Free Speech, Free Spirit," rings a bit hollow. As The New York Times wrote of Neuharth in an editorial earlier this year, "For better or worse, he is credited with hastening the corporate consolidation of the newspaper business and with pushing print journalism to cater to a TV generation with a new look that favors graphics, color, and shorter articles." Indeed, the Newseum appears to reflect some of his propensity for "happy news," including simulated newsrooms where everyone looks way too gleeful. 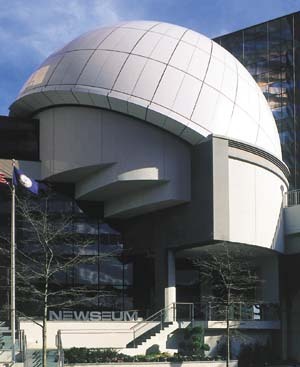 Not unreasonably, foundation officials expect the new Newseum on the Mall to double annual visitorship to one million (the Rosslyn building is scheduled to be shut in March 2002 as a money-saving device, meaning three years with no Newseum). But is a bigger and better Newseum really the best way to help journalism worldwide? The museum's executive director, Joe Urschel, a former USA Today reporter, notes that 18 to 20 percent of Newseum visitors report that their visit left them with a significantly enhanced appreciation of the First Amendment -- a nice but hardly awe-inspiring statistic. On one level, the museum is an important force for public understanding of the news business; on the other, it seems to represent an effort to redefine news as an extension of pop culture -- the central film segment of each visit emphasizes that news is everything, it's now, it's exciting, it's dangerous, it's glamorous, it's the big and small of life (and death), and it's evolving. What's largely missing is an attempt to inculcate deeper values, explore the most controversial sides of the business, and capture the essential, troublemaking raffishness of the craft. Given its genetic origins, one wonders if the Newseum can ever provide a platform for practitioners of let-the-chips-fall-where-they-may investigative and enterprise journalism in an increasingly corporate-minded, bottom-line industry run by the likes of Gannett. Freedom Forum has long had an uneasy alliance with working journalists. The organization has given out hundreds of generous fellowships, most of which ask little in return and serve as comfortable platforms from which to write books, launch publications, or unwind a bit from the rigors of the daily routine. And editors and reporters who enjoy the fine food and drink at the foundation's seminars sometimes refer, off the record, to the "Feed 'em Forum." Chairman Overby insists the foundation remains committed to both its diversity effort, which is widely credited with making it possible for smaller papers to hire and retain journalists of color in an effort to reverse a dramatic underrepresentation in the field, and its well-regarded Vanderbilt University-based First Amendment Center under John Seigenthaler, former editor of The Tennessean and founding editorial director of USA Today. But the drive toward Pennsylvania Avenue and a mass audience -- Overby calls it "fishing where the fish are" -- is the culmination of years of gradual withdrawal from the broader journalistic community. And it would take a lot to convince many observers that the international programs, which cost $7 million in 2000 (the last year for which budgets have been released), could not somehow have been spared. Many of the costs attributed to those programs had little to do with the fairly minimal expenses of bringing developing-world journalists together or providing them with a roof and some tools. Clearly, overspending on luxuries made up a fair amount of the cost. Offices opened around the world were in prime real estate with fine furnishings and sweeping views. A classic anecdote described briefly some years back by The Washingtonian and independently confirmed by CJR is telling: In 1992 the Freedom Forum sponsored a conference for publishers in the newly post-Communist Russia. The event, to which were invited not only Russians but American luminaries such as Katharine Graham and Tom Winship, was booked into a Scandinavian-run hotel in St. Petersburg with rooms running approximately $350 a night, where virtually all the food was imported. When Neuharth arrived like a potentate on his private plane, funded by the Freedom Forum, customs and immigration officials raced out to meet him on the tarmac. The topper was surely when Neuharth summoned a Freedom Forum vice president to his hotel room, shoved a roll of toilet tissue under her nose, and demanded, "Do you call this toilet paper?" -- after which he dispatched his plane to Helsinki, whence it returned with a softer alternative. In recent years Neuharth has traveled on behalf of the foundation to places such as Hong Kong, Beijing, Shanghai, and Tokyo, often accompanied by a small platoon out of Rosslyn. At the Ritz Carlton in Shanghai, the foundation paid for the presidential suite so Neuharth could entertain local journalists, and a private room for him even though he did not stay in the room overnight. Perhaps all this foreign travel is behind Neuharth's heightened appreciation for international coverage, which grew markedly after he left Gannett. "He did not evince a lot of interest in foreign news when he was coming up," says Bradlee. Now, he is said to be upset about the plan to terminate the international division, which sources say he had assured one division executive would survive. As for Overby, the current C.E.O., he declined to address the frequent charges that "gold-plated" spending habits had much to do with the center's problems. "I have found that there are three things that everybody knows how to run," he said. "They know how to edit a newspaper, they know how to coach a football team, and they know how to run a foundation." In the end, most visitors will undoubtedly appreciate the new Newseum. Kids will surely love, as Prichard pointed out, the chance to sit in the very chair in which the first woman was electrocuted, a 1928 milestone surreptitiously photographed by the New York Daily News photographer who smuggled a camera strapped to his leg into Sing Sing prison. Older viewers will surely gaze with awe upon pages from the Gutenberg Bible, symbolic of the printing technology that first made possible the widespread distribution of news and other information. Yet as entertaining and instructive as those spectacles undeniably will be, they have little to do with the day-to-day challenges faced by most journalists -- practitioners of a profession whose raison d'être is getting at the truth, regardless of how difficult that might be and whom it might disturb. That was something Freedom Forum, excesses at the helm notwithstanding, once seemed dedicated to supporting.